Karen Throsby is an associate professor in the School of Sociology and Social Policy at the University of Leeds. In this video, she talks about her recent (auto)ethnographic research on marathon swimming. 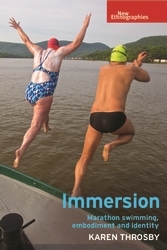 Immersion is about the extreme sport of marathon swimming. Drawing on extensive (auto)ethnographic data, Immersion explores the embodied and social processes of becoming a marathon swimmer and investigates how social belonging is produced and policed. Using marathon swimming as a lens, this foundation provides the basis for an exploration of what constitutes the ‘good’ body in contemporary neoliberal society across a range of sites including charitable swimming, fatness, gender and health. The book argues that the self-representations of marathon swimming are at odds with its lived realities, and that this reflects the entrenched and limited discursive resources available for thinking about the sporting body in the wider social and cultural context.